Mexican electricity is it’s own special thing, working reliably for years, and then getting flakey as all-get-out, as some ground on the CFE transformers goes bad, or the transformers go bad, or the tap goes bad, or the branches of a tree 2 blocks away have grown to touch the bare CFE wires when the wind blows, or the tree branches grew to touch the wires and really short things out when they wet from rain and the wind blows them into the CFE wires. … or if your own house ground goes bad … or some mystery wiring junctions buried inside one of your house walls start to get damp and corrode … or some outlet box gets too damp from water wicking up from the ground through the concrete walls causes the connections inside the outlet box to start to corrode, or … some previously unknown junction box on top of your roof gets too damp and hot & cold changes (from the blazing tropical sun) causes the connections inside the roof junction box to start to fail intermittently. For all these reasons, some of us put our computers, TVs, stereos etc onto voltage stabilizers ~ power conditioners that damp out and mostly fix all the too high or too low or intermittent voltage issues …. but sometimes even those burn out. Anyway, after 6 years of troubleshooting & fixing all of the above, we had 4 years of stable clean power, but our one power conditioner that protects the computer-TV room still burned out (within the warranty period) burned out about 2 years ago … After finding the well hidden manuf. warranty service center (… in some guy’s living room… about 4 miles away, back in a 1-exit-1-entrance subdivision), we had the power conditioner working fine again … for another year. I tried hard to find the source of the unusual smell, but it was in about 3 different areas, and I had zero success finding it … plus with the windows open, it appeared that it might be floating in from the neighbors house (which is about 5 feet from our house).Well…. I came down the next morning to no internet … no lights … and no power …. but only in the TV-computer family room (that’s on the power conditioner). Yep… the power conditioner is … toast. … Burnt toast. The fuse is fine, but the main board of the conditioner has one wire that’s melted off & burnt its covering => which means only God knows what other components on the board are also … toast … blaming the problem on the power conditioner that’s now failed twice in three years. And yes, smoke generators, that no longer smoke, are not worth anything other than their weight in scrap metal. 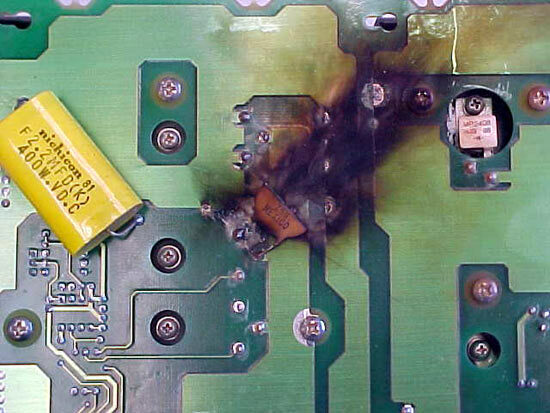 Yes, the fresh spare power conditioner is ‘Out of Service’ … but at least it’s only a burnt fuse this time. Which leave me wondering … What’s up? My desire for an internet fix is stronger than my curiosity, so I take the power conditioner out of the dedicated family-room circuit, plug the Family room circuit directly into CFE …. and joy of joys… the internet router ~modem comes on, lights come on … everything works fine. I sit down to type & poke around on the laptop … and I hear a low humming sound. …. I realize I’ve heard that same humming sound 3 days ago … but since the neighbor built their house using our lot-line boundary wall as their home’s exterior wall … and since that side of their house has no windows – just openings to allow fresh air (and mosquitoes) to flow .. I imagined that the humming came from their ancient washing machine & even-older fridge that sit about 8 feet from the window next to my couch (where I heard the humming). I poked around trying to find the source 3 days ago, but the humming stopped in about a minute – not enough time to find it – and it’s always easier to blame the neighbors, anyway. the hum returns … for just 90 seconds … and … It’s coming from right outside the family-TV-computer room window. The dratted electricians … wired the water pump … to the TV-Family room circuit … with no breaker. It’s still dark out, so I get out the headlamp-along with screwdriversto go try to unfreeze the pump… but … the plumbers have plumbed the pump in a big space, with just 1 inch of clearance on the back of the pump – so there’s no access to free the pump shaft… and the plumbing must be shut off & drained … to break open the copper pipes & remove the pump … to free up the shaft … to get water up to the rooftop tank… for the wife to take her shower … and to stop burning out power conditioners. My solution? … Cut the wires to the pump (so it doesn’t try to come back on) … get back on the internet …. and wait till after dawn to deal with the pump. …. Just another early morn in Merida …. ~ The sun is up. ~ The plumbing does not leak. ~ Maria Alba is taking her shower. ~ The water pump has cheerily filled the tinaco on the roof. ~ It only took about 20 minutes to extract the pump, to feed light oil into the ~exposed~ dry back bearings, apply a big wrench-driven screwdriver to the pump-shaft to liberate it, re-connect the electricity … and stop the small drips at the unions. just in time for the rain to start sprinkling as I gathered up tools & tape. 50 cents of oil, electrical tape & teflon tape => Success! … time to go to Mom’s house … to replace a burned~weak breaker on her water heater. Sorry for the situation/situations Steve. But, thanks for the entertaining report! I was smiling as I was reading because…..We have all been there in one way or another! .. On both sides of the border. btw: don’t know if this works for you but after a great ebay auction deal on a 12,000btu portable air conditioner paying $100 including shipping which a friend imported in their vehicle … we’re NEVER without air conditioning when another unit fails (except obviously in a blackout) … a local university student with technical abilities is on call retainer for the rest … result: comfort living … beats Las Vegas from where we hail.